Are you the entertaining type that enjoys having friends and family over to visit? Do you have family that lives out of town or possibly the country and would love to give them a comfy place to stay when visiting? Consider a guest suite in your basement. Add new flooring, walls, lighting, door and paint with some bright or neutral colors to keep a welcoming look. The addition will create value to the home and give an overnight guest a private place to stay. Adding a bathroom is always a good idea, especially if you currently only have one bathroom in the house. The basement is a great space for an additional bathroom as usually the access to pipes and the septic system is nearby. Enclose walls, add some warm and inviting tiles, vanity, and toilet. This would also be an excellent space to add those luxury bathroom features such as a hot tub, or a large walk-in shower with “rain like” shower fixtures. If your family and friends are into games, be it pool or video games, a gaming area in the basement is the perfect use for space. Framed in walls that are freshly painted to a neutral color, padded or even heated flooring, updated ceiling with bright light fixtures can turn the drab to fab. Add the pool table, fuse ball table, video gaming system, and more to the area to finish the look. Now your family is ready for long winters, and rainy days or even hot evenings in the summer when you don’t want to be outside. Why spend money on a gym membership only to fight the traffic and the crowds once you get there. Work out in the privacy of your own home. A vast array of ideas exists for home gyms. For instance, a weight space to a dance/yoga area, the sky is the limit. Don’t forget to add in a first-rate sound system to get you motivated as well as heated flooring for your toes to stay warm if aerobics or yoga is your thing. Creating a family room for movies, cuddles and good times is always an excellent use for a basement space. Make the room special by adding some fun luxuries into the room. Consider a small refrigerator for drinks, built-in shelving for books, or padded cushy carpeting for tiny toes. The goal of this space is a getaway for the family. Provides some extras that the rest of the house does not. Maybe a large theater wall with a giant screen and surround sound? If you are the type that wants to entertain your friends for some adult fun, consider a home bar in your basement. Consider granite or wood countertops, beautiful wood exterior, and shelving with lights galore. Custom bars can be made to fit just about any size area from big to small and have an unlimited number of ideas to install. Tv, sink area, lights and more can be installed. 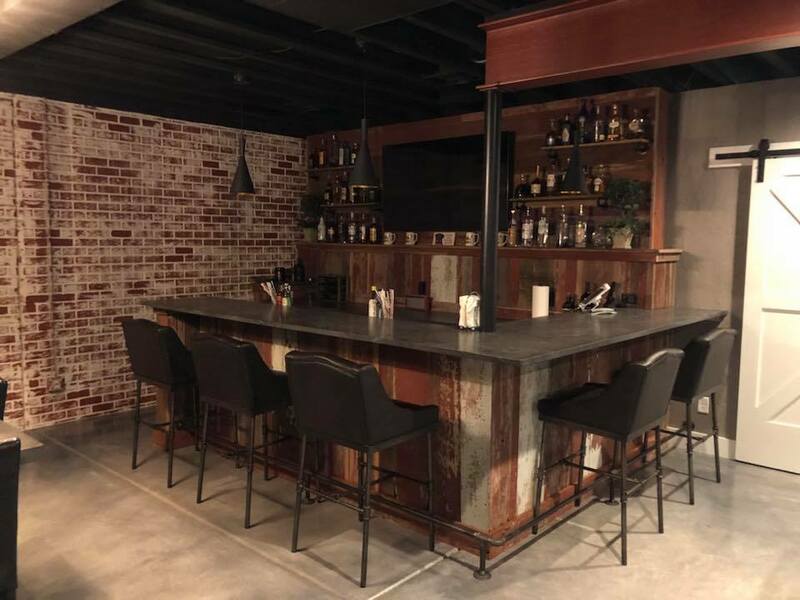 Also don’t forget to upgrade the floor with custom tiles laid out in a pattern to finish off the look, making your home bar a place for fun for years to come. Creative basement remodeling ideas can change the fuction and look of your basement. Even better, combine two or three ideas and make the space amazing. Whatever your decision, when it is time to remodel your basement, contact High Quality Contracting Inc. We are the experts in basement remodels. Planning Spring Construction Projects In Winter- Top Reasons Why You Should Start Now. 5 Deck Ideas that are Game Changers. Moving? How to Stay Organized While Packing. Check Out Our BBB Rating!